The Music Box has a new lounge. Get there. Chicago’s favorite indie movie theatre just got a facelift right in time for the Oscars. What you need to do: check the calendar. See what’s what. Then prepare yourself for some old school romancin’ (i.e. dinner and a movie). Here’s your game plan. Gear up for your evening out with a quick pop-in to Boga’s newly minted West Loop retail shop. It being winter and all, exercise your right to layer. Contrast is key here. Simple Stone Twill button-up. 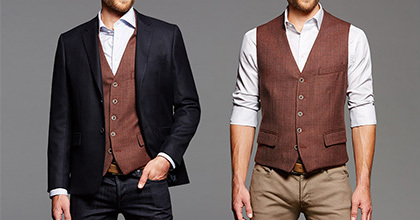 Match it up with tailored vest in navy and throw a grey blazer on top. Classy and casual. Pizza. Wine. Ceres’ Table is the place. Relaxed neighborhood setting just a quick cab ride away from the Music Box. 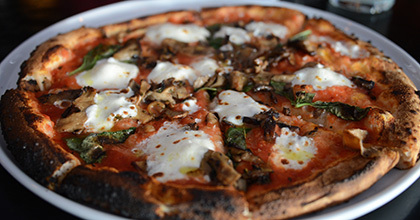 Chef Giuseppe Scurato plates up a canon of delicious shared plates (enjoy the menu), but his reputation in Lakeview is built on the char of his pizza. The crust: puffy, thin, slightly crisp. Order the prosciutto di Parma and arugula. Add egg. Win at dinner. The Music Box Theatre’s newly renovated lobby and lounge space is reason alone to go see what’s new. What you still get is all the charm of a 1920s art-house theater, but now with craft beer and cocktails. Take that, IMAX. Now’s your chance to check out some lesser known Oscar-nominated flicks like Russian hockey doc Red Army and the highly acclaimed Belgian drama Two Days, One Night. Also recommended: WBEZ’s Sound Opinions at the Movies — this go ‘round they’re discussing Sid and Nancy.